Hillary was Secretary of State back then, but the State Department dragged its feet for a week or two, and apparently Bill decided to not meet with the 15 Russians on his list. Rather, Bill cut to the chase. Read my post, Who wanted to meet with the Russians? Bill Clinton. saying criminal charges leveled against him are aimed at reversing gains made by working people under 13 years of rule by his leftist Workers’ Party. Authorities said Mr. da Silva directed a “criminal orchestra” that skimmed $6.2 billion reais ($1.9 billion) from inflated contracts at Petróleo Brasileiro SA, funneling the money to the Workers’ Party and its allies to personally enrich themselves and to sway votes in Congress to keep a lock on power. Lula says so because by now prosecutors labeled him the kingpin at the center of Brazil’s largest-ever corruption scandal, and things are not looking good. Considering the amounts of money involved, the sheer volume of the corruption, and the length of time it lasted, it is amazing that Lula’s prosecution got this far. Lula’s probably the most amazed of all. 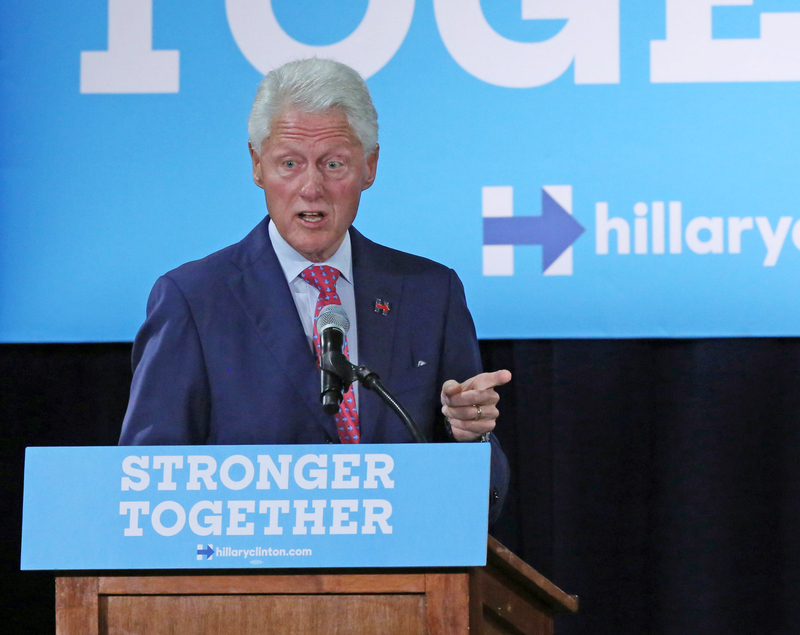 Bill, who not only used the “Make America Great Again” when convenient, who forgets it was the Dems who filibustered the Civil Rights Act, and whose Clinton Foundation only spends 5.7% of its $92million budget on grants, is probably as astounded as Lula that his wife’s presidential campaign is not looking good. What is not surprising is that, having run out of arguments, both characters are now in panic mode. Judicial Watch today released 10 pages of new State Department records that include an email sent by State Department spokesman Brock Johnson alerting Cheryl Mills, Hillary Clinton’s then Chief of Staff, that a “significant” Freedom of Information Act (FOIA) request had been made for records showing the number of email accounts used by then-Secretary of State Hillary Clinton. Over at The Atlantic (not exactly an arm of the Vast Right Wing Conspiracy, or VRWC™), David A. Graham actually engages in journalism and offers From Whitewater to Benghazi: A Clinton-Scandal Primer. Newly released emails show the complicated nature of ties between the Clinton Foundation and the Clinton-led State Department—and the high risk of conflicts of interest. The week’s big news: Pres. Obama removed Cuba from the list of state sponsors of terror, as part of a deal brokered by the Vatican, in exchange for which Cuba had to do nothing. The top headlines in the hemisphere: FIFA corruption; as expected, its re-elected president blames the U.S. and England. Cristina’s not running: ‘CFK will not be candidate in the upcoming elections’ . . . maybe. ‘Meteorite thieves’ held by policePolice in Argentina arrest four men who appear to have been trying to steal more than a tonne of meteorites in the northern province of Chaco. Nestor Cerveró, Petrobras’ former director of international operations, was convicted of money laundering and sentenced to five years in prison. One reason for the talks’ resilience is that both sides are used to negotiating during bouts of violence, which did not end even during the quietest periods. Military action by the FARC fell by 85% during its ceasefire and civilian deaths fell by 73%, according to the Conflict Analysis Resource Centre (CERAC), a think-tank in Bogotá. Even so, CERAC recorded 21 attacks by the FARC (and suspects it was responsible for another 75). Mr Santos has staked his reputation on concluding a peace agreement (by the end of this year, he hopes). For the FARC, the alternative to peace is further pounding by the armed forces; it no longer hopes for victory. Ecuador’s Monetary Council has published a resolution making it mandatory for private and public banks to deal with transactions in electronic currency. Depending on their size, banks will have between 120 and 360 days to register as Macro Agents of the electronic currency system in the central bank. The resolution reiterated that the central bank is the only entity authorized to issue electronic currency, and that the electronic currency must be backed up by liquid assets of the central bank. The money will be used for “undetermined” projects in Haiti. Mexico Shelves Key Part of Education OverhaulThe Mexican government suspended its planned teacher evaluations that were a cornerstone of the country’s education overhaul, in a decision ahead of midterm elections that dissident teacher groups threatened to boycott. A fearless Mexican-American cook routinely travels 2,000 miles, driving through a drug war and slipping out of kidnappers’ fingers, all in the name of a decent mole poblano for her New York customers. Inexplicably, they let her go. Global Migrants Brave Panama’s Vipers, Bats, Bandits to Reach U.S. Fat lot of good that’s going to do: Puerto Rico Governor Signs Law Raising Sales Tax to 11.5 Pct. To cover its $1.2 billion in debt service due this year from sales tax alone, it would have to raise over $10 trillion in sales – absurd. Abd al Hadi Omar Mahmoud Faraj [a.k.a. Abd al Hadi Faraj], 40, from Syria and Tunisian Abdul Bin Mohammed Ourgy [a.k.a. Abdul Bin Mohammed Bin Abess Ourgy], 50, will marry Muslim women at a mosque in Montevideo. Diosdado is now reading members of NGOs Provea and Public Forum emails on TV. So many Evitas, so little time . . .
Never been a fund like the Foundation Eva Peron! . . . But that’s not the point, my friends. Accountants only slow things down, figures get in the way. Never been a lady loved as much as Eva Peron! Bill handled earthquake aid while Hillary was secretary of state. The nation deserved better. On February 24, former President Bill Clinton was in Haiti to celebrate the opening of a luxury Marriott Hotel in Port-au-Prince. Like most foreign-backed projects in Haiti, the Clinton Foundation was a key player in its development. And like most projects involving the Clinton Foundation, a shady Clinton crony is running the show. 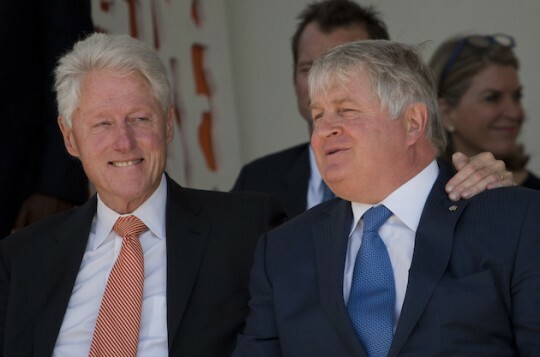 The 175-room hotel is owned by Digicel Group, the Caribbean and Central American telecom empire run by Denis O’Brien, an Irish billionaire who officially resides in Malta to avoid taxes and serves chairman of the Clinton Global Initiative’s Haiti Action Network. Digicel, the largest mobile provider in Haiti, invested $45 million in the project, which also benefited from $26.5 million in financing from the World Bank-affiliated International Finance Corporation. But it was Bill Clinton who made it all happen. That the accusers are funded by right-wing conspiracists. That everyone does what the Clintons did. That the media pick on the Clintons. That they are moving on, to work on behalf of the folks. No way I want the Clintons back in office. Davalos is accused of promising Bank of Chile executives the government’s ear in return for a CHL$6.5 billion (US$10 million) loan for Caval Ltd., a company half-owned by his wife, which previously held assets of under $8,000. The loan was used to purchase land for a housing development that was later sold at a $4 million profit. Maybe he thought he was related to Bill and Hillary Clinton. The president said the anticorruption measures will be complemented by a new constitution. 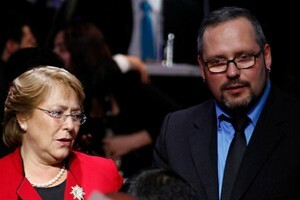 The government is expected to start work on the new constitution in September, Ms. Bachelet said. The current constitution was implemented during the military dictatorship of General Augusto Pinochet. This rewrite was a campaign promise; Bachelet intends to use proceeds from the mining industry to pay for propaganda social programs, which currently the Constitution does not allow. Bachelet’s popularity rating is currently 32%. The economy is sliding as investment and growth drop following her tax increases. She’s going to end school vouchers.